Ruger is a 6 month old blk and red male. He resides with Dan and Regina D. in Torrington, Ct. He loves his Kong and puppy tread tire toys, and also watching the squirrels and birds out the window. He will start training for S&R, air scent tracking, and cadaver recovery. "Survivor Tire Trax" - High Quality Tough Natural Rubber - LARGE - Black - 6" - Great for Everyday Use for Large & Extra Large Dogs !!! Your Ruger is beautiful too!!!! Of course I had to read your story when I saw your pup's name was Ruger! 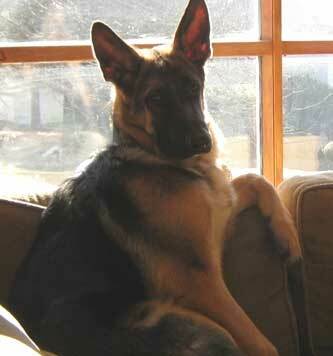 I think that is the perfect name for a big handsome GSD male. Your dog is beautiful! I just started my Ruger on tracking. He is doing great also at Rally and his other obedience classes too. They are so smart. My Ruger loves his Kong floppy frisbee, he goes nuts with it. I dont let him chew it though, wouldnt last long. Take care :). What a big boy you have and handsome too! No doubt he will be your protector. Take care of Ruger and he will take care of you. Thsnk you for sharing the story of Ruger. I also have a German Shepherd Puppy. Her name is Chloe, & she will be 10 months old, April 29th. She also has a Kong Toy(Black), that she loves. You mentioned, one of Ruger's toys were Tire Tread Toys. Are they heavy duty, & where, can you find them? Again, thank you for sharing Ruger's Story.